Toronto, ON, November 15, 2018 - Buying a natural Christmas tree is a win-win - it is an opportunity to bring the beauty and aroma of Ontario’s forests inside during the holiday, which is eco-friendly and supports not only Ontario tree farmers but the provincial economy. On top of being socially and environmentally responsible, buying a real tree is also fun! Rob Keen, Forests Ontario CEO, confirms that nothing beats a family outing to pick the perfect tree on a snowy weekend trip to the local Christmas Tree Farm. •	The most popular Christmas tree are spruce, pine or fir. Spruce trees tend to lose their needles first, pine and fir trees shed them slower. •	Do the drop test! Lift the tree a few inches of the ground and let it fall. Choose the tree that drops the fewest needles. Then gently grab the inside of a branch and pull your hand toward you. You’ll know you’ve found a great tree when the needles do not come loose in your hands. •	When you buy your tree, have a short piece cut off the base to make it easier for the tree to take up water. Be sure the cut is straight to ensure that tree will stand up properly in a sturdy water-filled stand. •	Speaking of water – ensure that the tree has enough water and keep filling the stand. This will keep your tree looking its best throughout the holiday season. •	Another way to keep your tree from drying out is to place it away from heat sources. •	Remember to measure your space so you can buy a tree that fits your home. Leave room near the ceiling for your perfect tree “topper”. Choosing a real, locally-sourced tree supports the provincial economy. Most real Christmas trees are grown on tree farms, which provide employment and income for families. 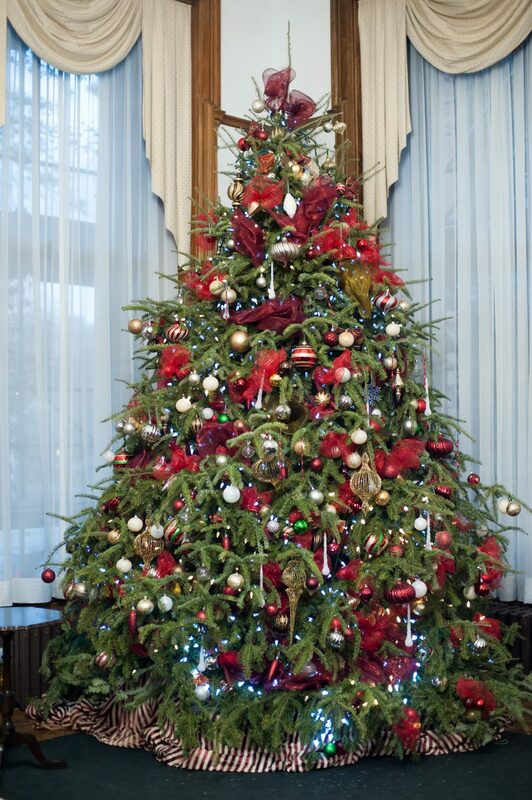 More than 500 farmers produce upwards of one million Christmas trees each year in Ontario. Christmas tree farms are also carbon sinks, soaking up carbon dioxide emitted by cars, planes, and our homes and in turn producing life-giving oxygen. In fact, one acre of planted Christmas trees can produce enough oxygen for 18 people daily. Real trees are 100% biodegradable, meaning that when disposed of properly, they may be recycled into mulch for city parks, habitat for fish and wildlife, or even materials for crafts! Real Christmas trees give back to our environment long after the holiday season. Artificial trees can be convenient, despite storage challenges. However, the environmental impact and carbon footprint of producing, packaging, and transporting a plastic tree across the world are inconvenient truths. And ethical reasons aside, you just can’t beat the pine-fresh scent and beauty of a real tree! If you live in or around Toronto and can’t get to a Christmas tree farm this year, fear not! Real trees are sold at many downtown and suburban retail stores. Check out the iconic Toronto Christmas Market, where you will find Forests Ontario selling Christmas trees during the first two weekends of December. For each tree bought, Forests Ontario will plant a new tree. Customers will also receive one free entry into the Market with each tree purchase! Forests Ontario is the voice for our forests, working to promote a future of healthy forests sustaining healthy people, Forests Ontario is committed to the re-greening of Ontario through tree planting efforts on rural lands and in urban areas, as well as the renewal and stewardship of Ontario's forests through restoration, education and awareness. Visit forestsontario.ca or follow us @Forests_Ontario.